Built for Sportsman and Bracket racers when weight is of the utmost concern. These 100% new featherweight Be Cool crossflow radiators feature a single 1-inch core saves more than 4 lbs. compared to the equivalent Be Cool dual core unit. 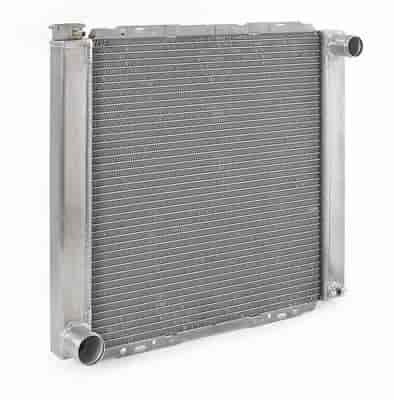 These crossflow radiators feature a performance-grade, single core with ''form-folded'' tanks. With this tank design the easy-fill billet filler neck with high-capacity overflow tube is placed horizontally to eliminate air pockets and insure the cooling system is completely full. These single pass design models feature a 1-1/2'' slip-on hose inlet and 1-3/4'' slip-on hose outlet. Additionally, all versions of the Featherweight Drag Racing Radiators are constructed with ''twist resist'' upper and lower protective aluminum core rails for extra rigidity and are designed for simple yet effective universal cradle mounting. Each radiator is 100% pressure tested before being shipped in expanding foam packaging. Available either cradle or flange mount design.